The end of the year means we all win. First, we can reflect on what we did right over the last 365 days (congratulations), and then, to reward ourselves, we can ransack clearance sections to “invest” in the trends we weren’t sure about earlier. Fortunately, this list goes hand in hand with that M.O., because let’s face it: it’s not like this year was lacking in fashion trends. Here are ten of the biggest, best, and brightest (in some cases, literally) that you can lay down your hard-earned dollars for 'cause you know they'll still be fine to wear next year. No one here’s going to suggest anybody go out and buy real fur (for a million different reasons), but you can easily find faux versions that interpret fall/winter 2014 looks by Sacai or Prada. In fact, the faker-looking the better: the nineties were rich in kitsch (see: dyed, fuzzy sweaters you wore to YMCA dances and are seeing again at chains like H&M and Forever 21), so if your true teen self would’ve been partial, it’s a slam dunk. And then, every so often, practicality and style go hand-in-hand. 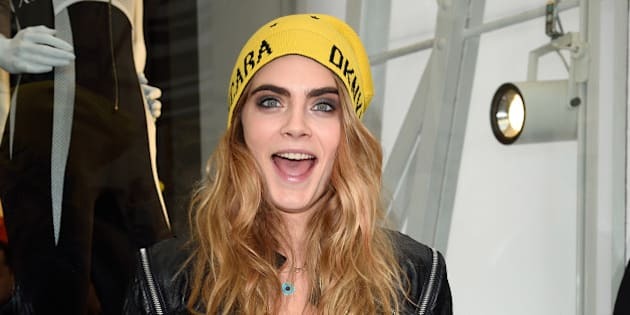 Enter: the globalized acceptance of beanies (or toques, duh), brought to new life by the likes of Cara Delevingne, who designed her own line for DKNY. Basically, this year gave all of us permission to wear hats again, which seems like only a novelty for anyone who’s never lived through the polar vortex. Can you believe they came back? (Of course you can because that’s how fashion works.) Phillip Lim brought his interpretation of the trend to fall/winter 2014 runways, while even Cheap Monday -- skinny jean connoisseurs -- brought their versions to spring/summer 2015 shows. But don’t throw your skinny pants out just yet (because what a waste of money that would be): if anything, 2014’s fashion landscape just allowed for more wiggle-room. Which, in the case of wide-legged trousers, is literal. Let’s get comfy! (And other mottos we can apply to 2014.) Faux athleticism ruled the school, which meant that instead of stiff, uncomfortable anything, we found ourselves in elastic waists and cotton. And who’s complaining? On the high end front, Nike and Pedro Lourenco teamed up for “luxury gym wear,” while at the mall level, American Eagle added sequins to their styles because, bless us everyone, this year didn’t care about your rules. What will automatically help you avoid looking too comfortable while wearing stretchy pants? Leather. (Because we all know this: add leather to any outfit and you will immediately look on-point and/or terrifying. Either is fine.) 2014’s affinity for leather was one for the books, as is its incorporation into pants and skirts. Kenzo’s use of leather grounded bright colours and metallics, while even Karl Lagerfeld issued a pair of blue denim pants earlier this year. Basically: add a leather thing to any outfit, and boom -- you’ve got yourself 2014. Scarves as blankets! Blankets as scarves! Here’s the fashion industry’s answer to getting cozy: designers like Burberry helped spring’s cape trend evolve into something winter-appropriate (see: scarves that double as small blankets), while the trend was carried on by store brands like H&M, whose jacquard-weave scarf could probably be made into a fort.